I had previously arranged to meet some friends for dinner, but changed those plans when I was invited to join some of the other mah-jongg folks for a get-together. I was going to have to bow out of the mah-jongg gathering after two hours, then I could join my friends as arranged... just a couple hours later, was all! Little did I know what was in store for me when I joined the "other mah-jongg folks." When I walked into the room, I saw that it was a bigger deal than I had been led to think. 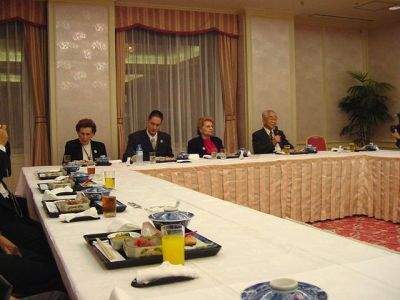 Ruth Unger was at the head of the table with Okuma-san, and Noguchi-san was there. Dragon and Keri Chang were there, and several of the Chinese leaders. It was an executive-level meeting, and I was caught off guard! See the Chinese man in the red jacket? You'll see him again later (hint: on the bus to the airport). Mr. Nagi (waving), Bob Lee (wearing his mah-jongg necktie now instead of the one with eyes on it), Dan Glimne, and Ryan Morris. There were many flowery speeches. But the main topic was when to hold the next tournament... and where. That's Nobuhiro Kishimoto saying a few words, and Dragon Chang in yellow, to the right of Kishimoto-san. Both later came to Los Angeles to promote mah-jongg (click their names to read more). I was dying. This dinner was extremely important, and couldn't be "bowed out of" as easily as I had thought. I was going to be late meeting my friends. I'm afraid that when I got the mike, I skipped the flowery stuff and spoke my mind on the main topic, in as few words as possible. Probably not exactly the way things are usually done in Japan. Ruth agreed with my opinion, anyway! The entire group posed for a shot. If you look closely, you'll recognize faces from some other pages on this website. Like for instance this one, this one, and this one. The man in the red jacket is standing next to Mr. Shengqi (both of whom came to the 2003 CMOC - as did Dragon Chang). 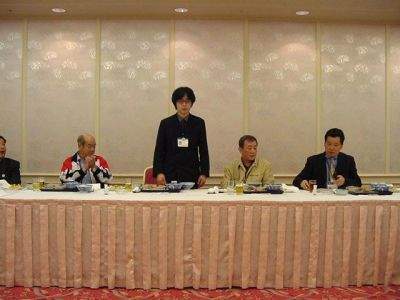 And third from left, first row, is Martin Rep, whose Mahjong News website is tops in Europe! When the camera clicking was all done, I'm afraid I beat a hasty retreat. I made apologies to everyone and ran to meet up with my Tokyo friends.